The KROTON Hela Wigmen rugby league franchise would like to thank Governor Sir Peter Ipatas and the people of Enga and the EPG Enga Mioks for naming the round 15 match this Sunday at Aipus Oval in Wabag as Agiru Memorial Cup. Wigmen Chairman Andy Hetra said “The historical connection between the Hela Opena and Hela Huli brothers is still strong to this day where both are considered to be brothers. Folklore has told us that our Opena brothers live beyond the mountains of Mt Kare and Mt Tundaka. This Sunday we will be visiting our brothers in Wabag and we are looking forward for a good turnout for the game. The Chairman said, It is such a wonderful experience when we play our brother team and also to commemorate this game in memory of the founding Patron of Hela Wigmen Rugby League Franchise, Late Governor Anderson Agiru. 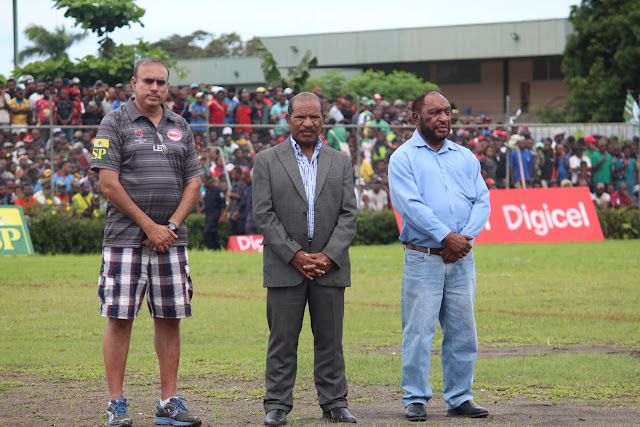 It is only fitting for his brother Governor Sir Peter Ipatas to host this Cup in recognition of the cultural bond and brotherhood these two provinces share and also to honor a great leader who has lived a legacy in many facets, especially in politics, business and sports. Mr Hetra said, while we understand that Mioks will want to fight for the minor premiership in their remaining 4 rounds, we are also fighting to keep our finals hope alive to make the top 5. We know that it won’t be an easy game for us. More pressure will be on Mioks after recording their first loss of the season in Mendi last weekend. Mioks wouldn’t want to do a second consecutive loss. Every remaining games for us is like finals footy for us. The boys are well aware of this and we will be hungrier to win. At the end of the day it will come down to the team that commits less mistakes. This is an area we need to work hard on, especially to cut down on silly mistakes and cheap penalties going against an inform Mioks outfit.